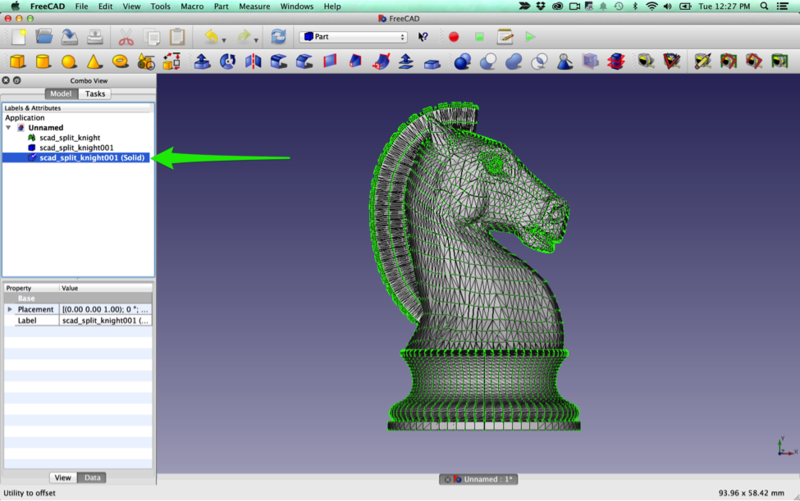 While we recommend using only solid models in your Bantam Tools Desktop PCB Milling Machine design workflow, sometimes your only option is an .stl file. Maybe you found the perfect object on Thingiverse or you used a 3D scanner, and there’s no reasonable way to begin with a solid model. This guide shows you the basics of converting an .stl file to a solid STEP (.stp, .step) file and then importing that into Fusion 360. 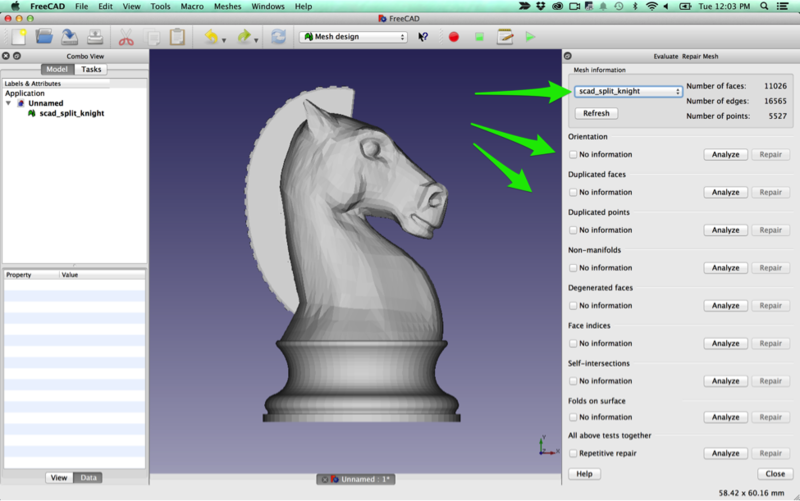 From there, our CAD and CAM Guide provides information on generating toolpaths. Disclaimer: STL files span a wide range. Some of them are low-complexity, watertight, and can be easily converted. Others are extremely complex, full of holes and self-intersections, and will cause the conversion application to crash. That being said, if you have no other option, it’s definitely worth a shot! 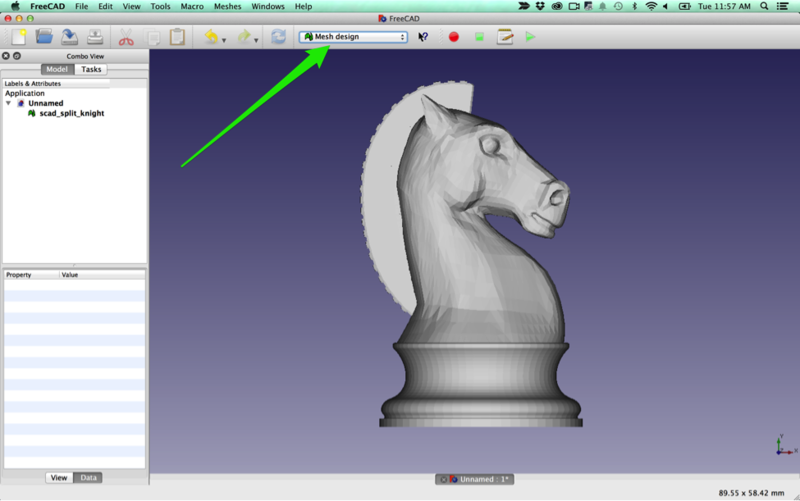 Read on to learn how to convert your .stl file to a file that you can mill on the the milling machine. Step 1: Download a conversion tool. Our conversion tool of choice is FreeCAD because it’s free, relatively simple to use, and does a good job of converting .stl files to usable solid models. Download it here. 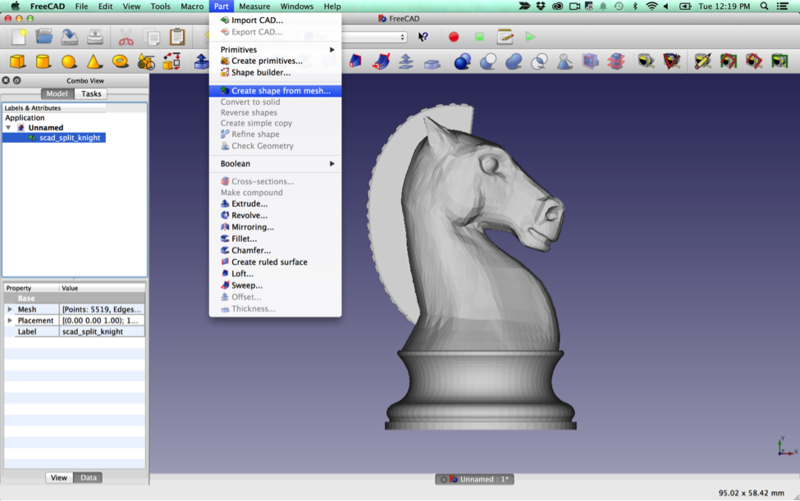 Step 2: Import your .stl file. Create a new file (File menu > New). Import your .stl file (File menu > Import > select your .stl file). 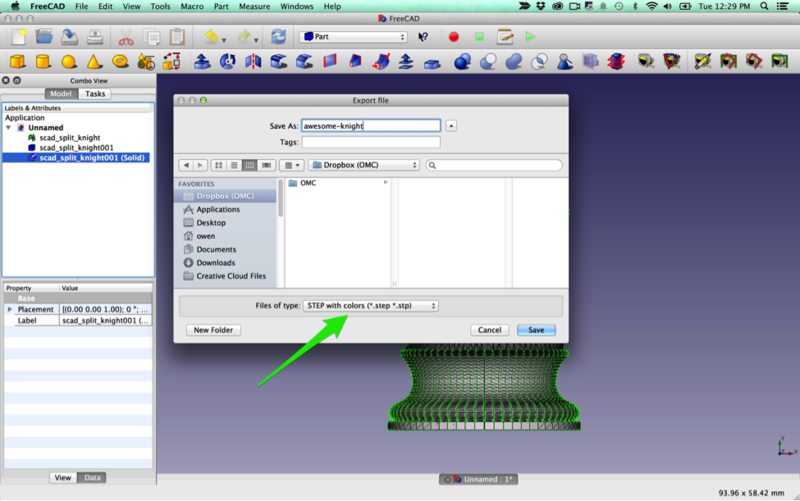 From the dropdown menu in the top toolbar, choose Mesh design (see screenshot). Step 3: Repair the mesh. Open the Evaluate & Repair mesh tool (Meshes menu > Analyze > Evaluate & Repair mesh). Select the mesh from the dropdown at the top of the Evaluate & Repair pane. One by one, go down the list, clicking Analyze and then Repair if the analysis finds any problems. If clicking the Repair button for “Folds on Surface” makes your mesh look terrible, you can skip that one. If clicking the Repair button for any other option makes your mesh look terrible, you’re likely out of luck. However, you should still try the next steps in case you get lucky. 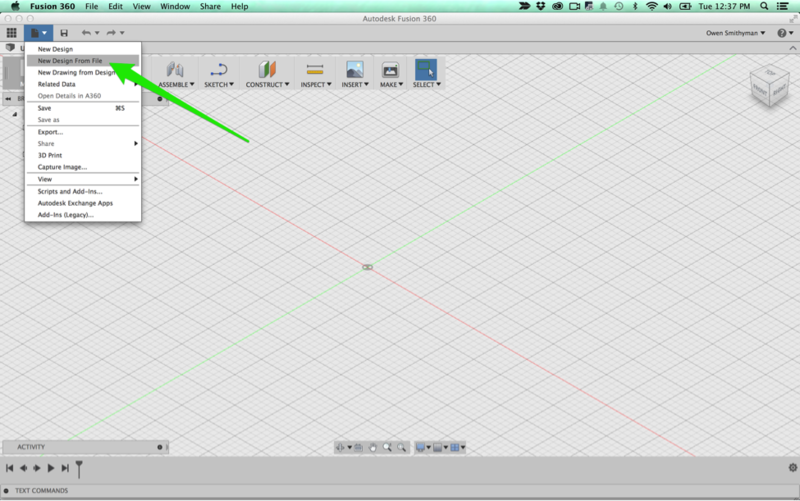 Step 4: Convert your mesh to a shape. From the toolbar dropdown menu, choose Part. 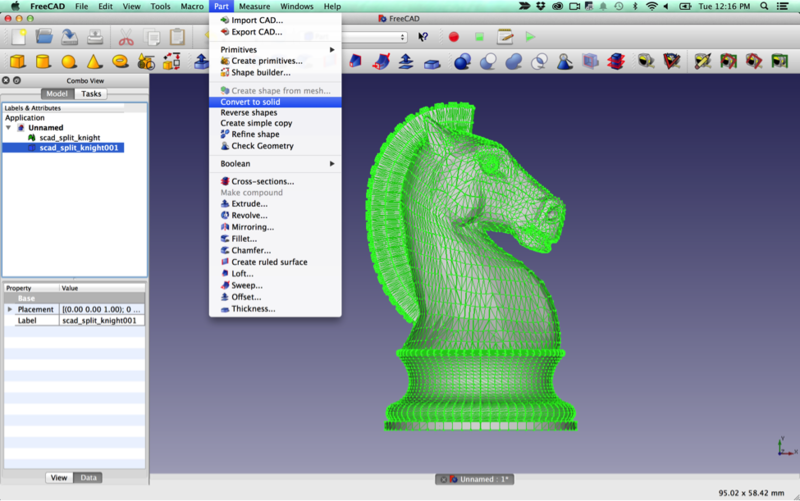 Select your mesh in the left pane. Leave the Sewing Tolerance at 0.10 and click OK. Step 5: Convert the shape to a solid. This is the moment of truth! If FreeCAD is able to convert the shape to a solid, you’ll be able to import it into Fusion 360 and generate toolpaths for the milling machine. If you get a red error message in the bottom left corner of the screen, you’re out of luck. Select the newly created shape. Step 6: Export your solid to a .stp file. Select your newly created solid file in the left pane. From the Export dialog, choose “STEP with colors (*.step *.stp)”. 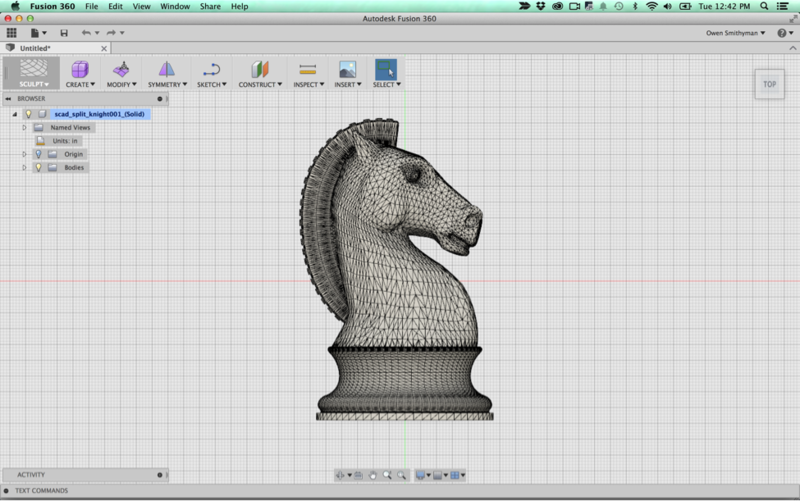 Step 7: Import your file in to Fusion 360. Locate the .stp file that you exported from FreeCAD. Click Open, then wait for it to load. If you’ve gotten this far, you’re ready to do CAM and generate toolpaths! CAM is a deep subject; if you’re not familiar with it, we recommend going through Fusion 360’s CAM tutorials and reading our Fusion 360 Guide. If you’re already comfortable with CAM, happy milling!